Experience a sense of WELL-BEING radiating from the glow of the Heartfelt Living Salt Tea Light Holder. Tea lights have a positive aspect on one’s spirit and mood. 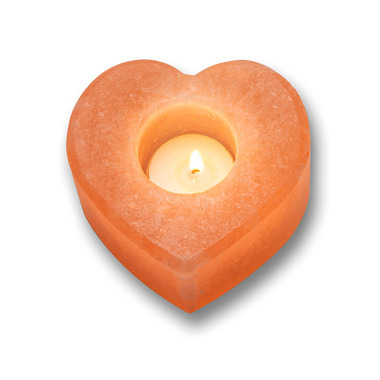 Salt tea lights will not create as much negative ions as the salt lamps do, but it still help to clean and purify the air. Burning candles light up the tea lights and if the flame is within the tea light holder, it creates a small amount of the negative ions. Really pretty. Smooth, unblemished rock and it is HEAVY! For such a little thing. Excellent quality. This tea light holder is wonderful. It is a substantial size, is well-crafted, and looks great when lit. The hole for the tea light is a perfect size and I could not be happier with this purchase. Great price, too! Highly recommend.